A man murdered in Belfast on Thursday night has been named. Robert Edward Joseph Molloy Jones, 30, was left seriously injured following an incident in the Parkmount Street area of north Belfast just after 9pm. The father-of-one had been living close to where he was murdered but he was originally from Lurgan. Detectives from Police Service of Northern Ireland’s Serious Crime Branch have launched a murder inquiry. A 21-year-old man was arrested on Thursday night on suspicion of murder. He remained in police custody on Saturday after detectives were granted an additional 36 hours to question him. Police have not commented on what they believe the motive for the attack may have been. Detective Chief Inspector Pete Montgomery has re-issued an appeal for information. “The community in the local area may hold vital information which could help to establish the circumstances surrounding Robert’s murder,” he said. “I would like to thank the community for the help they have provided so far and would appeal to those with any information to contact detectives. 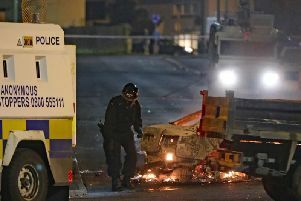 North Belfast MP Nigel Dodds has urged full co-operation with police. “This has caused great shock in this settled and close-knit community off North Queen Street,” the DUP representative said. “I wish to appeal for full co-operation with the police, in what is now a murder investigation.